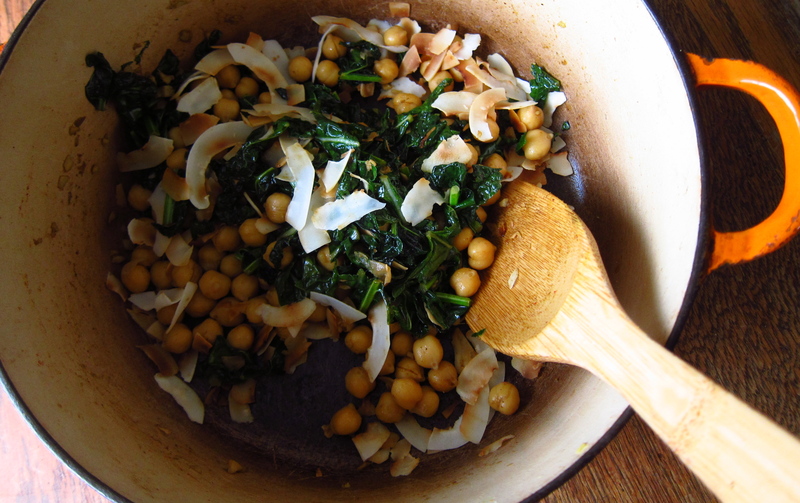 Ginger-braised kale with curried chickpeas and toasted coconut. feeling so scattered lately! creeping overwhelm, dropping some things, hiding from others. amazing people around me, but the thought of trying to keep up with everyone makes me twitch a little. projects — grad school — paid work with Buddhist Peace Fellowship (climbing toward a setup where more people can be compensated for their work) — solidarity with a long-term campaign to democratize a union, keeping revolutionary politics at the center — political meetings that meld seamlessly into feliz cumple fried chicken dinners and laughter, laughter — reading the communist manifesto out loud at alameda beach with a friend — vivid, vivid dreams — monkey-mind internet reading — still looking for the thing that is mine to give, mine to focus on. may you (yes, you) be safe, may you be well fed, may you know you are loved, may you defend others fiercely, may you know your gifts, your historical context, your people and your purpose.